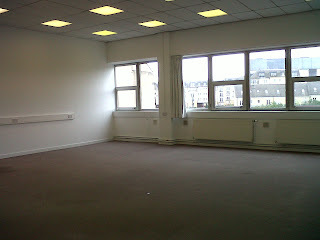 Work has started on the new studio space this week- firstly the old carpet pulled up so the floor can be painted. Lots more to do before everything can be moved in; kiln delivery organised, shelving ordered and delivered etc…the list goes on. Website is now live: www.cyanclayworks.co.uk. Please take a look and see what you think…later on in the month we will add payment details and a booking form for classes. But in the meantime there’s lots of information about what will be on offer! Everything should (hopefully!) be set up by the end of June. Details to follow of the official launch. There are lots of other artists, designers and small businesses in the building which is on Beaverhall Rd, Edinburgh. I have a new email address: fiona@cyanclayworks.co.uk, so do get in touch if you would like more detail on the tuition or other services that will be available.